In India, piercing has it has its roots in the rich tradition and culture. Jewelry reflects much more than aesthetic appeal. It’s a symbol of tradition, sentiments and an amalgamation of cultures! The piercing of earlobes and/or nose of a baby girl has long been a tradition in various Indian cultures. The art of piercing can be found in the oldest mummified remains, over five thousand years old. Nose piercing was recorded in the Middle East dating back to over 4000 years. Piercing of the nose has been described in the Vedas in reference to the Goddess of wealth Lakshmi’s nose rings. The Ayurvedic text Sushtruta Samhita explains the health benefits of nose piercing. The practice of skin piercing was brought in modern India by the Mughals in the 16th century. The ear lobes may have been the first attempt in humans with regard to piercing due to the effortlessness with which it could be done. Adorning the ear lobes has been a practice since 3000 B.C. The earliest style of designs was hoops or pendants. In Europe during the Middle Ages, earrings became superseded by the large and decorative hats that were in vogue. By 1900 they were back in style and have maintained their popularity since. The 1970’s saw a change in trend with people wearing more than one set of earrings at a time, having multiple piercings in other areas of the ear and not just the lobe. The ‘Karnaveda’ is a piercing ceremony among Hindus done on children at the age of three or five. In some communities, it was done on males as well as females. Temple jewelry that was prevalent in the Chola, Krishnadeva Raya and the Pandya dynasties from South India is known for its unique designs. Pure gold is coated with silver and base metal and studded with precious and semi-precious gemstones to give them a classic look. Meenakari work and uncut diamonds are used along with Kundan to craft the temple jewelry in North India. The patterns in it consist of waves, dots, lines; floral shapes like the lotus, birds such as swans and peacocks; intersecting or zigzag lines and figures of gods and goddesses. 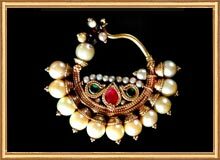 The temple earring design is used by performers of Bharatnatyam, Kuchipudi, Oddisi, Kathak and other dances. The inverted bell shaped earring is studded with rubies and other semi-precious stones and ends in a circular swirl of tiny pearls. This design is also available in plain gold. The other popular earring design is the ‘Karna phul’ or ear flower in 22k gold. This pattern has a large metal flower-shaped earring with a precious stone in the centre and a stud at the back symbolizing the stem of the flower. The Karna phul is available in a delicate filigree work too and is still a sought after design for special occasions. Jhumkas are a timeless design in earrings. Available in Kundan work, Meenakari, oxidized style (for the Navratri festival), plain hoops for casual wear, and kashmiri jhumkas with red and green color in a design of the peacock. Chandeliers, tassels, pearl drops and other minds –boggling shapes, are some of the earrings fashioned today. Piercing the nostrils have been in practice for a long time among Bedouin tribes of the Middle-East and the Berber and Beja tribes of the Africas. In the beginning, piercing had a religious and cultural association attached to it. In the 1960’s and 1970’s however, it developed into a rebellion against society. It is believed that the hippies visiting India during this time were influenced by the spiritual ideas and spread this custom in the United States and Western Europe where it multiplied. Nose piercing came to be associated with Punk culture. It is the second most popular choice after ear piercing among teens and young adults. Earlier, the nose rings were flat and had to be worn with a screw inside the nostril. They were mostly in the shape of a flower and called ‘Phul’. The other popular design was in the shape of a hoop with a pearl or a chain attached to it so that it drapes over the cheek and the other end is hooked to the earring or hair. These nose rings were usually in 22k gold. The social status of a woman was denoted by her nose ring, the metal or kind of precious or semi-precious stone that it was made of. The Maharashtrian bride wears a nose ring called ‘Karwari Nath’ which is studded with pearls called ‘Basra Moti’ and rubies. Bridge piercing is done through the small flap of skin on top of the nose. Curved and straight barbells are usually worn in bridge piercings. Septum piercing was a common practice among tribes of Nepal, Tibet, India and certain North American Indian tribes too. 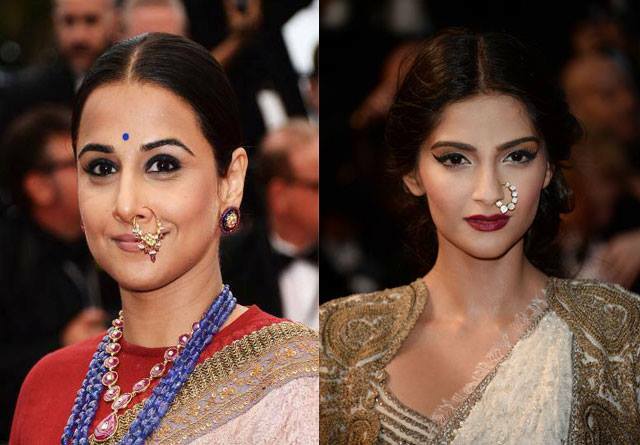 In India, the nose ring is called the ‘Nath’, ‘Nathani’ or ‘Nathori’. They are usually popular with brides. The rings are either in gold with a bead, or semi-precious stone but it’s not uncommon to find them in other metals as well among the women of lower classes. The popularity of nose piercing among performing artists are prevalent. The trusted goldsmith of the family was generally the one the child was taken to. There was an elaborate ceremony sometimes; according to local traditions. The vast majority of women in the West have their ears pierced with a piercing gun. Piercing guns are not recommended for piercing body parts other than the lobes of ears. The Association of Professional Piercers recommends that piercing guns not be used for any piercing, requiring members to agree not to use piercing guns in their practice. The myriad designs available in this kind of jewelry are diverse; as are the materials that are in vogue for both nose rings and earrings. Metals used to create nose rings are gold, platinum, sterling silver, surgical steel, titanium, glass and bioplast & acrylic. The shapes of nose rings are in twist, bone, hoop, L-shape and retainer and the preferred gauge is 18 or 20. There are nose rings in 14 and 18k gold in colors such as white gold, rose gold, green gold, and many other colors. Titanium nose rings that are anodized are dyed in many attractive tones such as blue, green, mauve, rose, black to cater to the tastes of the youth. Nose rings today are made out of gold in 22k or 18k; other metals used are titanium, niobium, silver, stainless steel and nickel. Nose rings and earrings are a part of a tradition as an adornment or a gift, for festivals, weddings, childbirth and any such special occasion. Earring jewelry offers a creative channel along with a vast array of materials to imaginative designers. The trend of wearing one’s birth stone as earrings is popular. The Rudraksh bead is often incorporated in earrings and materials like leather, lac, glass and plastic, Jute, ivory, terracotta and shell to name a few, are being used to create elegant and stylish earrings. Lately nose rings are available in simpler designs such as hearts, flowers, spirals and more to suit the trends followed by teens and young adults. Earrings and nose rings are available in numerous patterns and designs to suit most occasions and outfits. Piercing on ears goes great with ethnic wear, piercing on the nose either with a ‘nathni’ or stone can be carried off even with Western wear and Indowesterns Clothing. As with any kind of piercing, care has to be taken to get it done in the right way. A professional piercer is the one who uses sterilized needles and piercing guns for the procedure. The risk of pain and infection can be minimized in this way. It is essential to get advice about aftercare from a professional. The best way to care for your favorite earrings and other jewelry is to store them away from sunlight and moisture in a box, pouch or plastic bag. A soft cloth can be used to remove any tarnish that may form on jewelry other than 22k gold. Perfumes and perspiration can cause tarnish so the jewelry should be worn after applying it. A reputed jeweler can be entrusted to maintain the jewelry and give it a polish if required.